Millions of Aussies (about 1 in 5) deal with the sniffles and watery eyes that characterise hayfever. From Perth to Cairns, from Melbourne to Darwin, and even Alice Springs (mostly thanks to couch grass)—no region is spared. So, what are hayfever sufferers to do? There is no one answer to the question of how to stop hayfever. Because symptoms are the result of your own immune system mistaking pollen for something threatening, like a virus or bacteria, the only way to truly prevent hayfever is by staying indoors all the time, or investing in a respirator and full protective suit—and then installing an airlock at your home. So the next best thing would be to minimise symptoms, with a few lifestyle changes and hayfever remedies. Apply a small amount of petroleum jelly around your nostrils to help trap pollen before it enters your nasal passages. Use air-conditioning in your home and car, and keep windows and doors closed. Install a weather app on your mobile phone—make sure you choose one that offers pollen counts and forecasts. Wear sunglasses that wrap around your face to keep pollen out of your eyes. If your pets go outside, make sure they are bathed before entering your home. Wash your bed linens at least weekly, in hot water, and dry them inside rather than out on a line. Research any plants in your landscaping, and remove those that are known allergens. As soon as you come home for the day, change your clothes and jump in the shower to wash pollen off of your body and out of your hair. Despite your best efforts, you are likely to still experience hayfever symptoms—pollen grains are small, and sticky, and designed by nature to be blown great distances by the wind, and to cling persistently to anything they can reach. The makers of ZYRTEC® understand the discomfort, the inconvenience, and (sometimes) the embarrassment of hayfever symptoms. 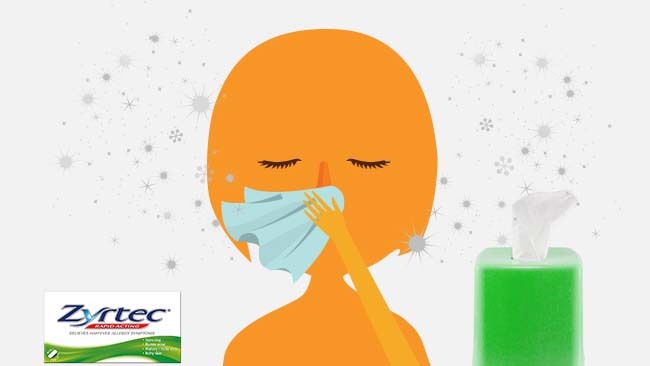 That’s why ZYRTEC® offers a wealth of educational materials for those who want to learn more about hayfever and other allergies, along with a wide range of products developed for hayfever sufferers, like you, to take control of your allergies and give your symptoms the boot.